I’ve been talking with some other artists lately about the motivation to make art–and how easy it can be to lose the intrinsic urge to make it by focusing on it as a means rather than an end. If you aren’t selling anything at the moment, or no one seems to be paying much attention, then it’s tempting to go outside and, say, plant some vegetables rather than struggle with a resistant picture. Art is hard work, but I do it mostly because it’s so pleasurable to finish a painting, and sometimes even more so if the image played hard to get. It’s easy to drift away from that zone where the effort is both constraining but also feels good, the reward of pushing back against a challenge, with the sequence of the hundreds of interim completions along the way toward being done. When it’s most frustrating, it’s easy to dismiss what Keats said about poetry: “If Poetry comes not as naturally as Leaves to a tree it had better not come at all.” But I doubt that he meant all good creative work has to be a first draft: Kerouac, non-stop with his long scroll of paper, or Edwin Dickinson with his premier coup work. I think what he meant was that the urge to create something comes naturally, and that’s why people do it, with no other purpose in mind. It’s an end in itself: which is what the “fine” in fine art really means, fin, the end. Adam’s job is, in part, to help museums open up their collections to art lovers on the Web, but he also talked about how social media and other online platforms, like Artsy, can connect artists with those who enjoy visual art. As always, the incredible quantity of available art makes it harder and harder for people to spot what they would love if they had a chance to see it–anyone who keeps up with music knows how difficult it can be to discover what you love, even with a medium that has the level of widespread popularity music enjoys. There’s just so much of it out there. Adam had some interesting things to say about visibility that weren’t about technology at all. He suggested artists need to articulate as clearly as possible the idea behind the work and communicate it. (That’s a slippery slope, but it makes sense to try and put into as few words as possible words why you’re engaged in art, even if it’s an effort that resists conceptualization.) He also said something that I’ve heard before: people want to hear a story. A friend once suggested that he’d love to read how each work in a show came together and why–and Adam said exactly the same thing. People want to know why you made a particular piece, and also why you paint, period. Time in nature feels wholesome and good, and the sense of life and meaning is so transparently available. This sort of self validation or intrinsic reward is increasingly not there in the world of art, or in the artist’s dealings with the world. At least, the pursuit of art these days often feels the opposite of time in nature: It’s hard to feel the point of it. Culturally, the art enterprise, especially fine art as practiced by people like us, seems almost completely irrelevant to the world at large. The “big” artists are servicing the 1%, and the regular artists don’t seem anything like necessary to most people. BUT I do think art still can be a meaningful, purposeful, necessary thing…. And hopefully others will agree, and support will slowly rally. In my better moments I think of art as a realm of life and hope that complements nature and, for society, may be similarly necessary. However, one has to be pretty strong, inwardly, to hold onto that sense of purpose, the confidence that people will get around to remembering why art matters, or will buy it or whatever. It’s definitely a time of crisis for the regular artist: collapsing markets and expectations, way more supply than demand, and a cultural marginality that’s no longer made bearable by the cultural constructions and glorifications and reverence that once made it seem important to be an artist. Everyone can make cool-looking stuff with their cameras and computers. I think art making–responding to the world, exploring vision, making meaningful marks, etc–will always be an activity of intrinsic value for some people–both artists and viewers. Engagement with the world through representation and other kinds of image-working and mark-making (with substantive, resistant materials) is a vital part of culture-building (culture as a collective realm for promoting shared experience, articulating and storing meaning). But art as a cultural project is almost certainly going through a major transformation, possibly equivalent to mass extinction by asteroid blast. Who knows what will come out on the other side, but probably not a whole bunch of wall space for all those little framed pieces of art that fill the closets of countless earnest artists these days. I’m not suggesting that traditional painting and drawing will necessarily become obsolete…I doubt they will… not to the artistically inclined. But the customary channels of appreciation and distribution and support seem to be breaking beyond repair. Or simply out of sync with the ways of the world these days. I guess because I see it as a puzzle, and possibly a spiritual opportunity, a creative challenge (artists that stand up for value and meaning , etc. in ways that reach people may do some good and find support), I don’t get as discouraged and depressed as I used to about the situation. I may even have some advantages – certainly by having my work linked to a story and having the chance to regularly encounter supportive strangers with the IAP (as do you, with your philosophical arsenal). But I do get discouraged and depressed pretty easily in general. 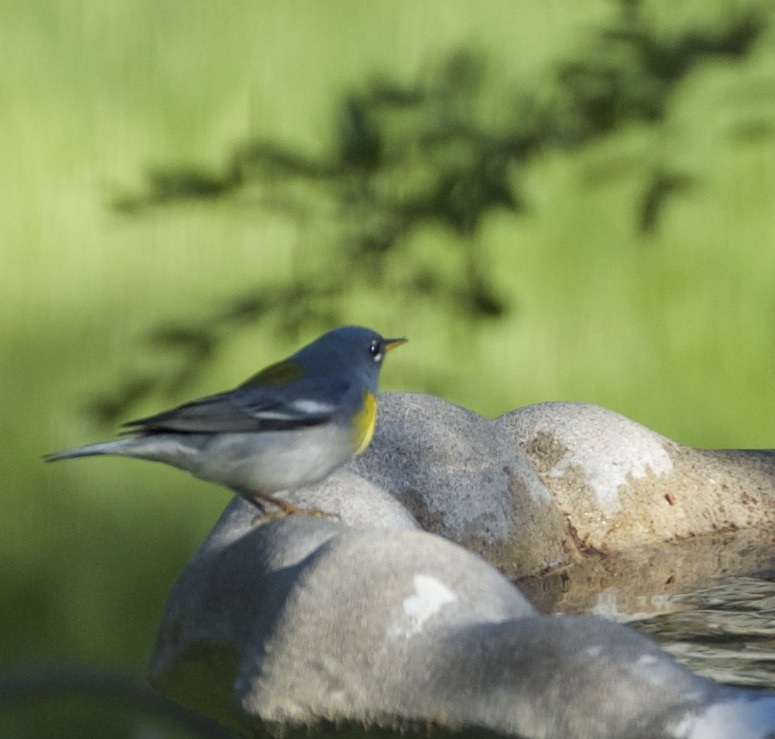 Warblers can be an easy antidote, but work and progress are a better fix. I couldn’t have put it any better, and probably not even as well, as Jim did here (as long as I’m right in assuming he was being sardonic about asteroid blasts.) The other dimension of making art that he and I have talked about is how completely antithetical it is to our media-induced passivity and fragmentation of attention. When you make a painting you’re requiring yourself to live in a completely backward way (in a good sense) that throttles the flow of stimuli from smartphone/iPad/TV/computer screen, which for most people now is a non-stop pinging of incoming color and sound, ever changing, a mental IV drip. Like meditation, painting narrows your field of awareness down to one very slow spot of color at a time, and you might spend days looking at that spot and working on it. In its own way it’s an act of rebellion against the tide of monkey-mind, clicking from one thing to the next in flight from feeling captive in the present moment. That alone is all the motivation one needs to do it. It’s a way of staying human against all the forces that seem to be eroding the old assurances about what it means simply to be a person. We live in nihilistic times that are quietly redefining (destroying?) human nature, I think, and it’s worthwhile to stand back from it and say, “Enough’s enough.” A painting can still offer painter and viewer both the same kind of stillness, the inclusive awareness of the world, that it has offered for hundreds of years, of a sort that nothing else does.